Palm Springs is an easy getaway for my wife and me because it’s only a ~2 hour drive from Los Angeles. 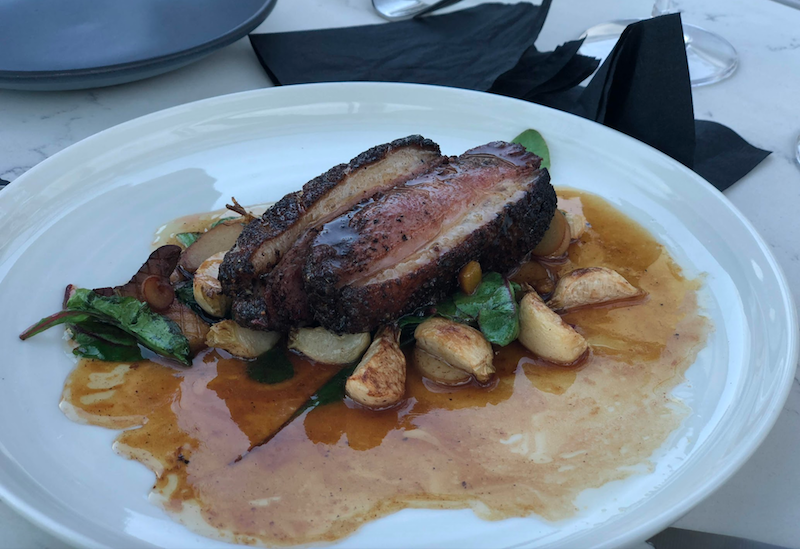 Although it’s super hot in the summer (usually above 100 degrees), there are lots of great restaurants and fun things to do in the area. Plus, it’s less than 1 hour from Joshua Tree National Park. 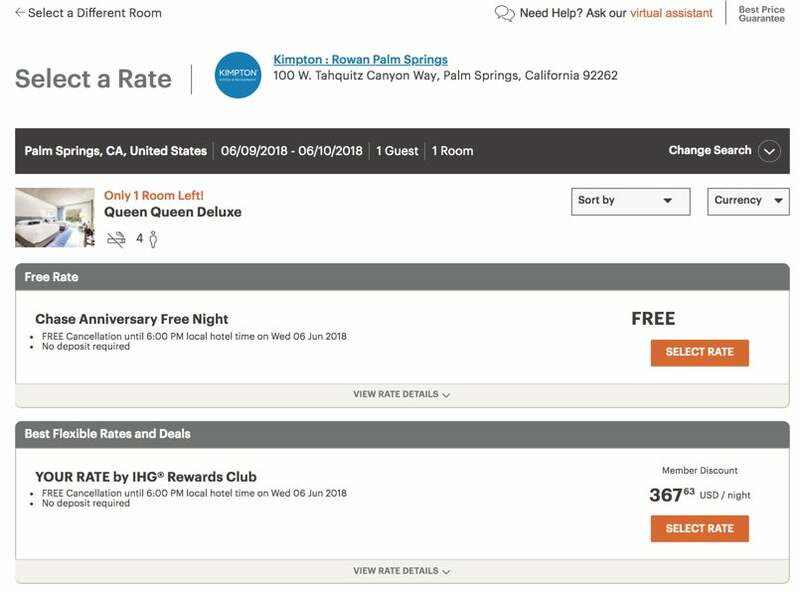 To celebrate my wife’s recent birthday, we used a free night certificate from the Chase IHG Rewards Club card (no longer available to new applicants) to stay at the Kimpton Rowan Palm Springs. This hotel is new to Palm Springs (opened in November 2017). It’s very modern, offers a free nightly happy hour, and has spectacular mountain views. 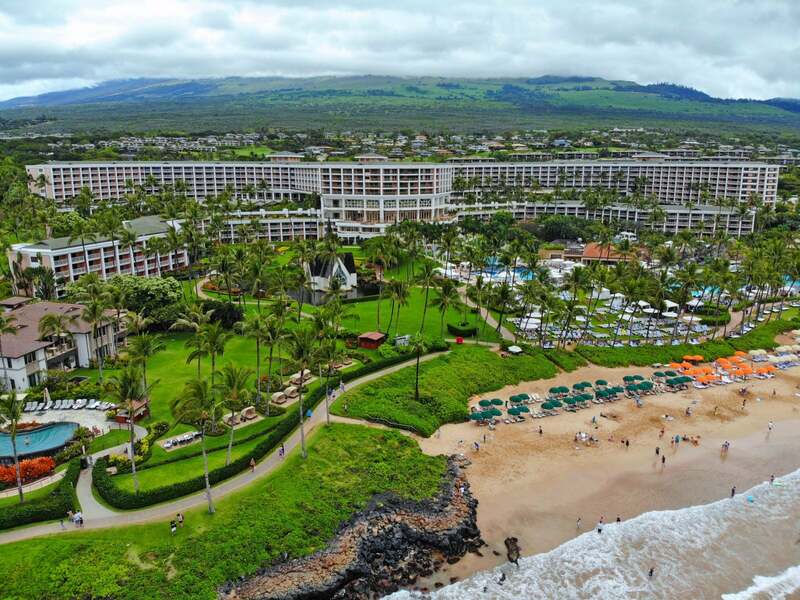 Unfortunately, folks with the new IHG® Rewards Club Premier Credit Card will NOT be able to redeem a free night certificate at this hotel because it costs 60,000 IHG points per night. The free night certificate with this card is restricted to hotels that cost 40,000 points per night or less. But if you have the old Chase IHG Rewards card like me, and if you earn your free anniversary night before May 1, 2019, you can redeem it at any IHG hotel. 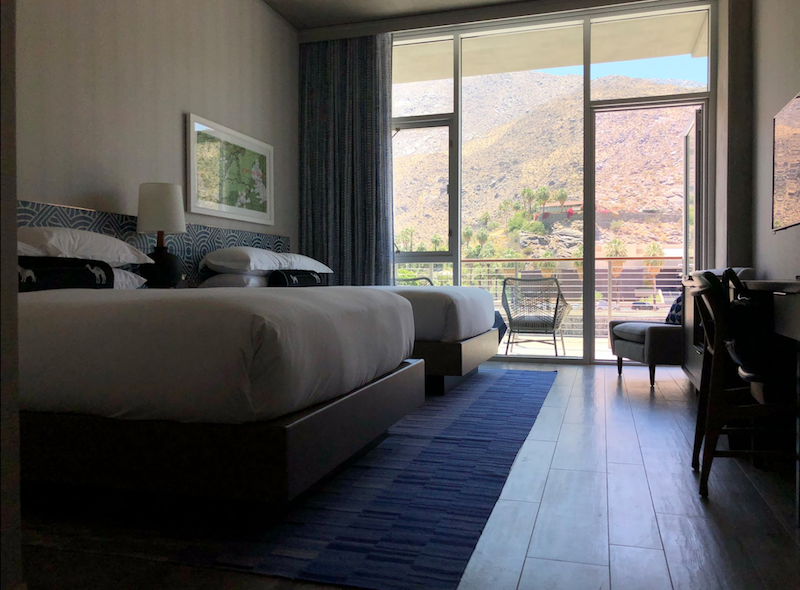 Here’s my review of the Kimpton Rowan Palm Springs. 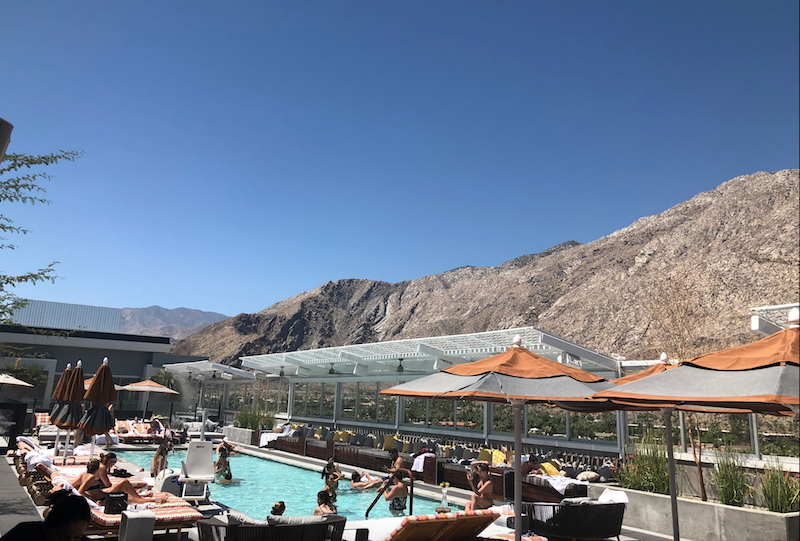 Redeeming a free night certificate at the Kimpton Rowan Palm Springs was a phenomenal deal because rooms were selling for $367 plus taxes & fees on the day we visited. I’m Disappointed the IHG Free Night Certificate Will Have Limitations in the Future Because My Wife and I Have Used It to Get Amazing Value! Depending on your travel dates, room rates drop as low as ~$160 per night if you’re paying cash. Or you can redeem 60,000 IHG points for a free night. Unfortunately, this hotel charges a ~$40 resort fee whether you pay with cash or points. This fee covers valet parking, pool access, coffee and tea in the lobby every morning, WiFi, and a few other perks. Everyone knows how much I hate paying resort fees. Fortunately, the hotel manager waived the resort fee during our stay because I pointed out that it was not disclosed on my email reservation confirmation. The hotel is in an awesome location! 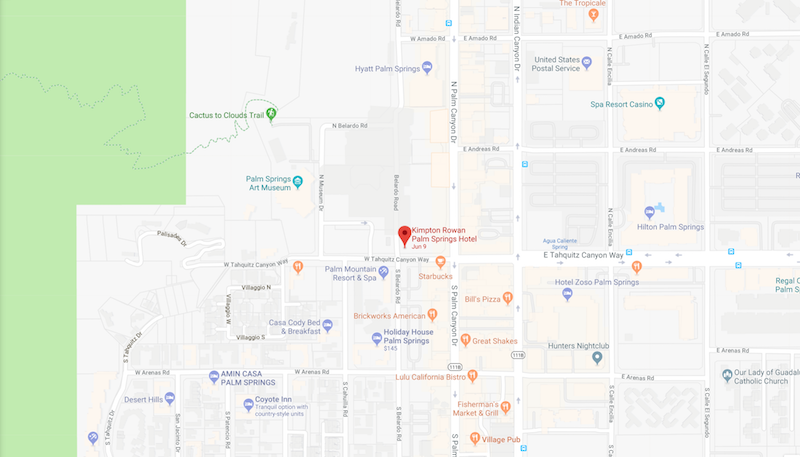 It’s right off Palm Canyon Drive, which is the main road that goes through downtown Palm Springs. So you can walk from the hotel to nearby restaurants and attractions, like the Palm Springs Art Museum. Here’s a view from the backside of the hotel overlooking the Palm Springs area. 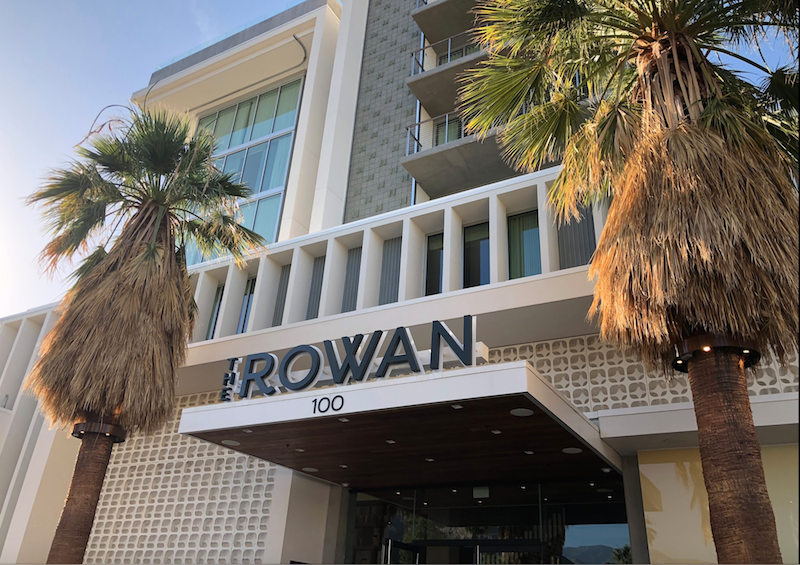 The Rowan Hotel Has 7 Floors and Is the Largest Building in Downtown Palm Springs. A Few Uber Drivers Said Some Area Residents Were Not Happy With a Large Building Being Developed in the City! The entrance to the hotel is accompanied by 2 tall palm trees. Valet is included in the daily resort fee, so you can grab your bags and walk right into the hotel lobby. The hotel lobby was very modern, with lots of natural light and seating. The lobby also has a bar and a restaurant (Juniper Table). 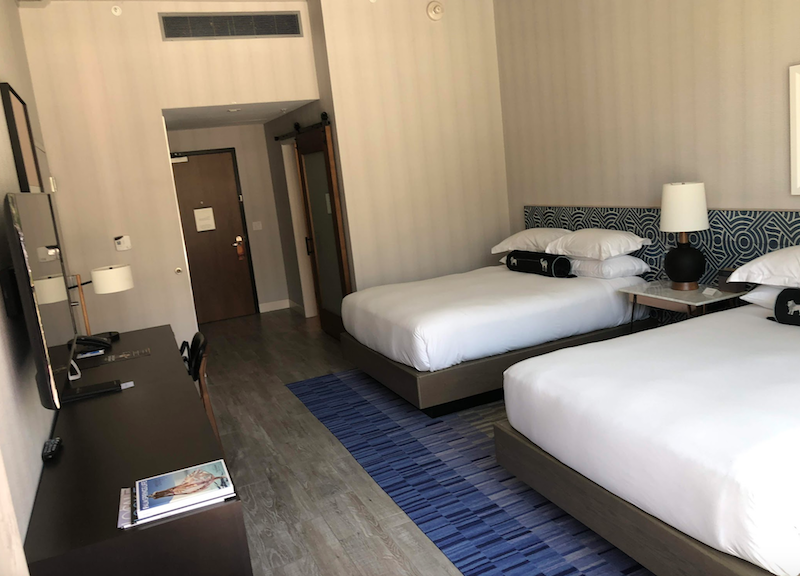 We booked a standard room with 2 queen beds because my sister-in-law joined us for the trip to celebrate my wife’s birthday. At check-in, we were upgraded to a room with a balcony and mountain view. Here’s a look at the mountain views from the entrance of the room. The balcony had 2 seats where you could enjoy the beautiful surroundings. 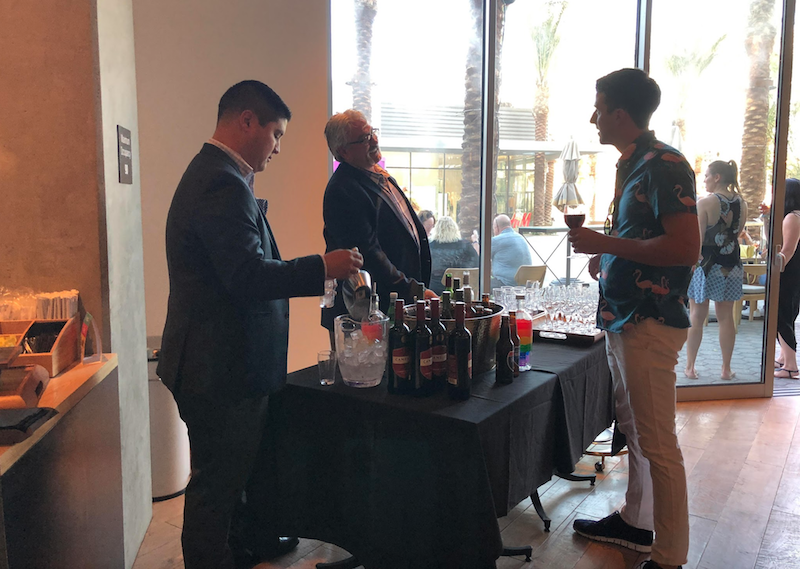 Everyone loves a happy hour with free drinks and snacks. The hotel offered your choice of 3 different wines, beer, and a vodka cocktail. The happy hour runs from 5:00 pm to 6:00 pm every day. The hotel’s pool is located on the rooftop. We spent most of our time by the pool during our stay. It’s nice that you can check out at 11:00 am and continue to use the pool afterward. Next to the Pool Is a Large Lounge Area With Plenty of Seating. Some of the Sectionals Were Reserved for Larger Groups Celebrating Bachelorette Parties! 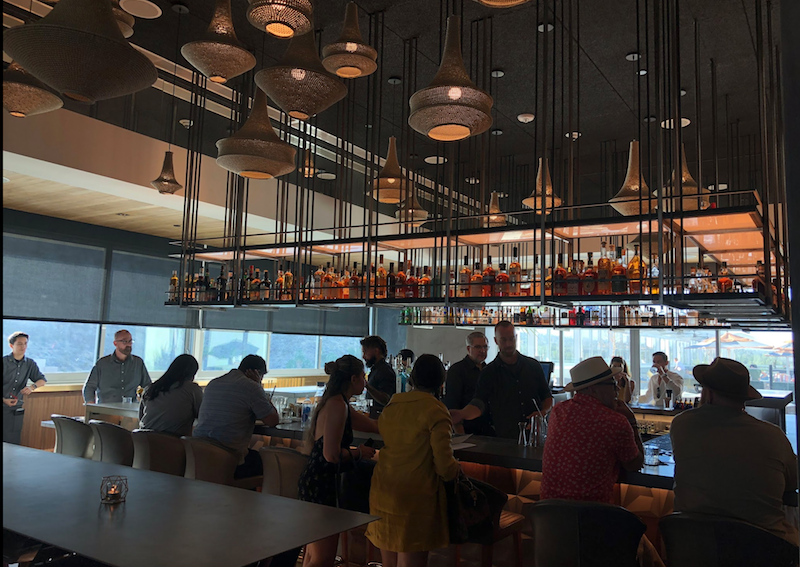 The rooftop is also home to a higher end restaurant and bar called 4 Saints. We ordered drinks and shared an entree at the restaurant, just to try it out. The menu was simple, but most of the items looked very tasty. We Shared the Duck, Which Happened to Come From a Farm in Pennsylvania Owned by My Wife’s Best Friend’s Family! 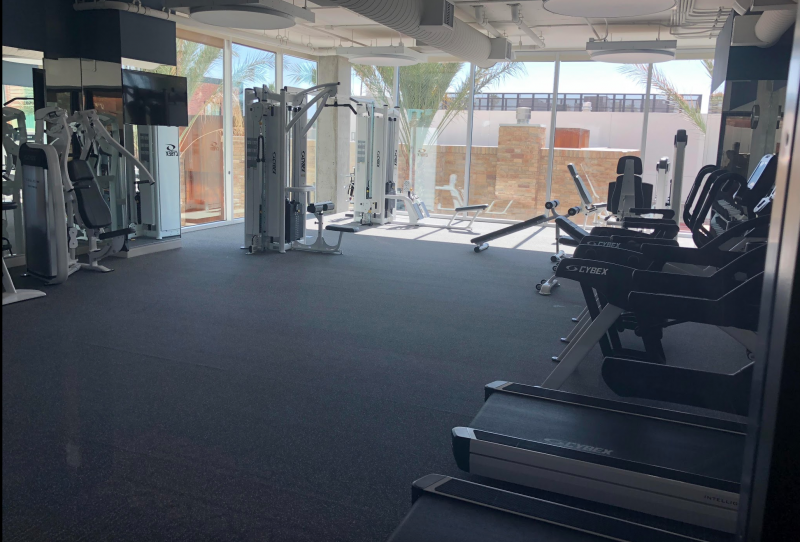 To burn off the calories, you can workout in the fitness center on the 2nd floor. 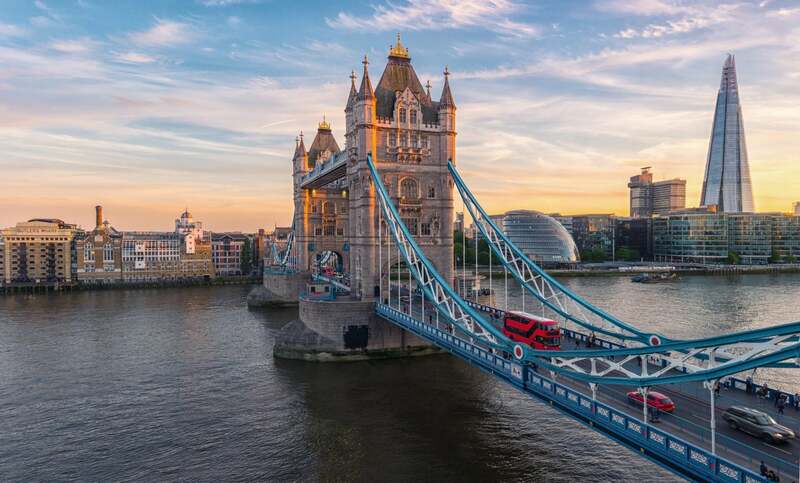 When you sign-up for the Chase IHG Premier card, you’ll earn 80,000 IHG points after you spend $2,000 on purchases in the first 3 months from account opening. The card comes with an $89 annual fee, that’s NOT waived the first year. 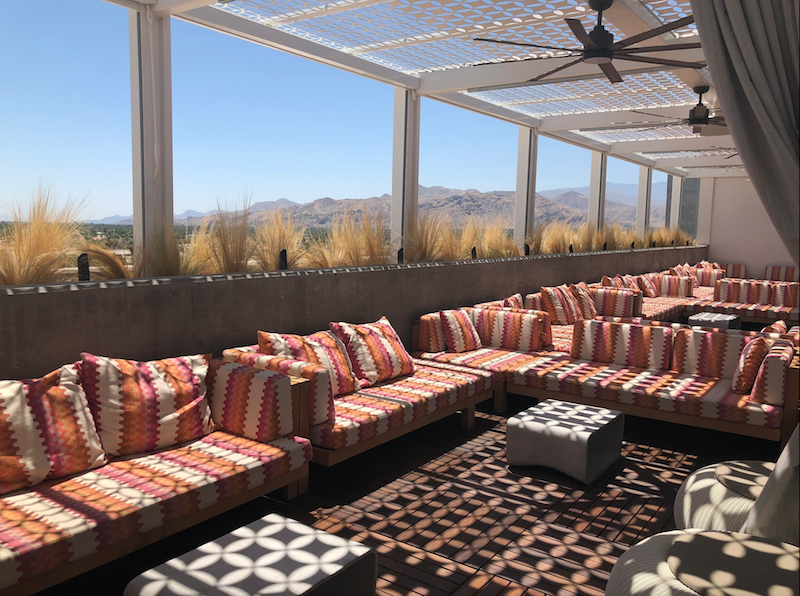 The Kimpton Rowan Palm Springs did not disappoint! 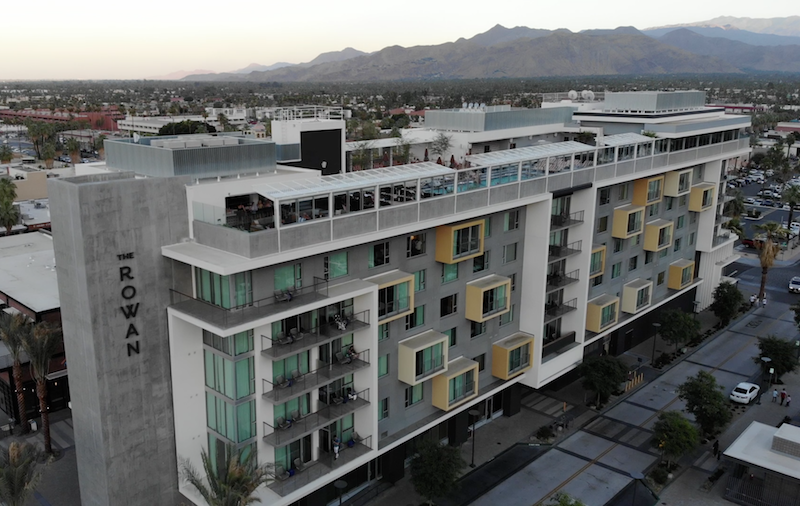 This new hotel is the tallest building in downtown Palm Springs and has spectacular mountain views! We used an IHG free night certificate to stay at the hotel. Or you can book a room with 60,000 IHG points. Nightly room rates at this hotel are ~$160 to ~$400 per night depending on your travel dates. My wife and I really loved this hotel and plan to go back in the future. The rooftop pool was a great spot to soak up the sun. 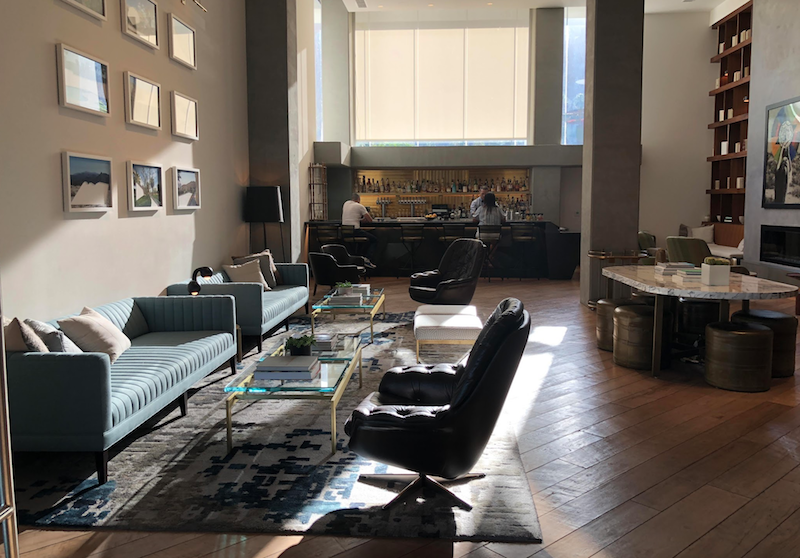 And the happy hour in the lobby was a nice place to enjoy a beverage before going to the hotel’s fine dining restaurant, 4 Saints. Do you have a favorite hotel in Palm Springs? Let me know in the comments below! Keith, can you please do a blog post about your drone? Seriously. I know nothing about drones and am in awe of the great photos you take using yours. Would love to know what kind it is, how you travel with it, and how you learned to use it. Absolutely! As a preview, the model I’ve been using is the DJI Mavic Air.